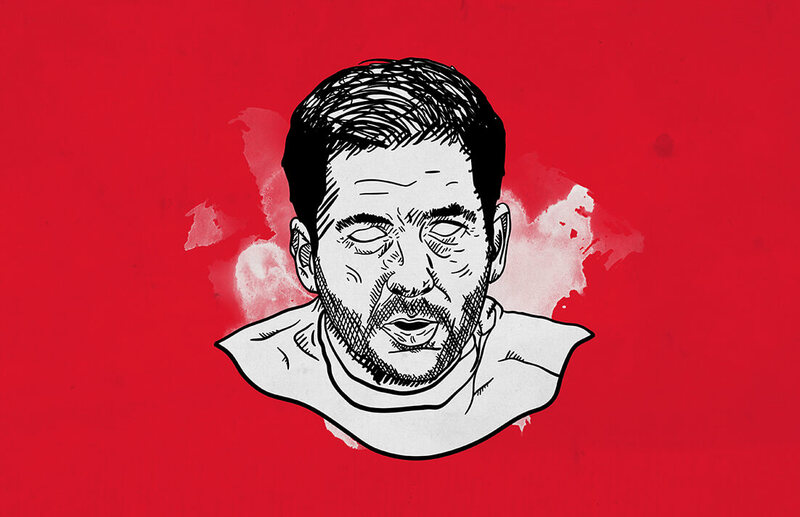 Throughout the last few years, many up-and-coming coaches entered the Bundesliga stage. One of them is Sandro Schwarz, head coach of Mainz 05. The 40-year-old German is the successor of world class coaches such as cureent Liverpool boss Jürgen Klopp and PSG manager Thomas Tuchel. After Mainz have barely managed to stay in the Bundesliga in recent seasons, they now seem to be more stable under Schwarz. He uses simple but effective tactical concepts at Mainz which are going to be outlined in the following analysis. Schwarz’s side attempt to play out from the back if possible. However, if the risk to lose possession at the back is too high, Mainz use long balls to progress up the pitch. When playing out, Mainz deploy a back four behind one single pivot. During build-up, single pivot Jean-Philippe Gbamin creates a central passing option for his central defenders. The full-backs stay in lower positions until the first line of press has been overplayed. 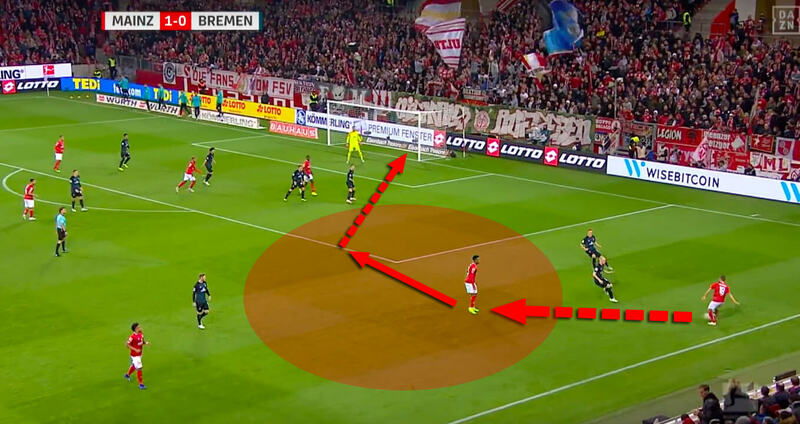 Once Mainz have found Gbamin in a position ready to receive and turn, both full-backs push higher up the pitch. The build-up players overplay the first line of press with a triangular shape. 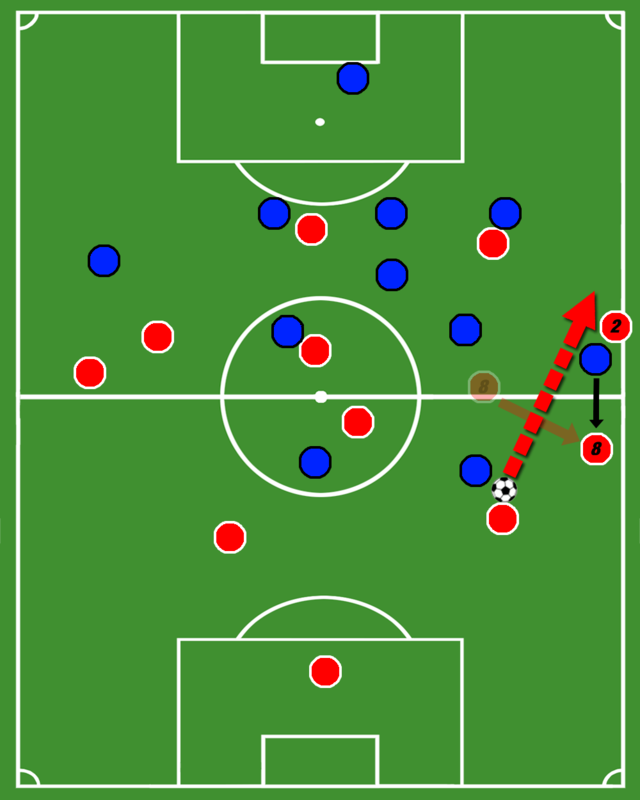 Besides occasional long balls, the central defenders play diagonal balls towards the full-back on the far side. This way, Mainz can switch play and thereby change the angle of attack. Moreover, the opposition need to drop to get between ball and goal, which Mainz use to progress up the pitch. Mainz overplay the opposition midfield with a diagonal ball to left-back Aarón Martín. Occasionally, an advanced midfielders drops into a full-back position and thereby allows the full-back to move up the line. Mainz preferably use this concept when the opposition is capable of closing down central areas. Central midfielder #8 drifts towards the wing. Therefore, Mainz full-back #2 can push higher up the pitch. The preferred formation of Schwarz in recent matches was the 4-3-1-2 formation entailing four central midfielders. This narrow formation allows Mainz to outnumber the opposition in midfield. Due to the numerical superiority in central midfield, Mainz can often play short passes through the centre. Often one of their strikers drops to receive and thereby drags an opposition centre-back out of position. Usually, this would leave the other attacker in a 1v3 situation against the three defenders of the back-four staying in their positions. However, Mainz can occupy the opposition full-backs with really high full-backs. As they position themselves on the flanks between the opposition midfield and defence, the opposition full-backs are unable to mark them. With the help of their high positioned full-backs, Mainz can isolate the opposition centre-backs. That creates a promising 2v2 situation for the Mainz striking duo. The presence of Mainz full-backs prevents them from supporting the centre-back. Since they cannot cover their central defender, Mainz create one-on-one situations up front that way. Whenever the opposition can close down all central passing options, Mainz play the ball out into wide areas. The flying full-backs in the form of former La Liga player Aarón Martín and Daniel Brosinski or Giulio Donati stretch the opposition block and create new gaps in central areas. If the opposition is horizontally compact another strategy of Schwarz is to play around the defensive block. Mainz occasionally play long balls towards their strike duo. Usually, one of the attackers receives the ball while the other one starts a deep run in behind the last line of defence. When the opposition full-backs are positioned too wide, this can create two isolated one-on-one situations near the opposition goal. While one striker tries to win the aerial duel, the other one starts a diagonal run towards the goal. To win second balls, Mainz attempt to outnumber the opposition in midfield by shifting towards the ball. Furthermore, the staggering of their central midfielders is key for their midfield dominance. 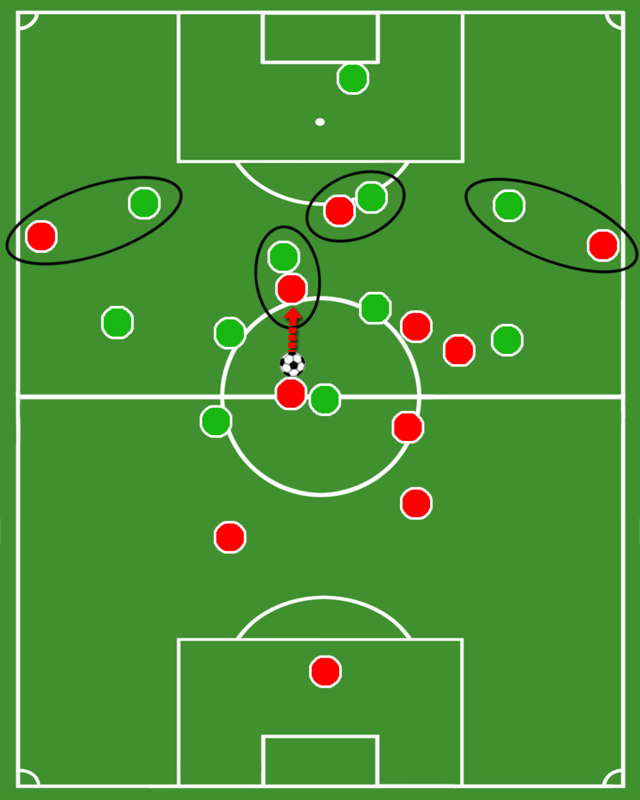 Compared to the flat double pivot of many teams, Mainz midfielders are positioned at different lanes and can therefore win back balls in different areas. Even against a single pivot and two advanced midfielders, Mainz take up positions between the opposition lines. 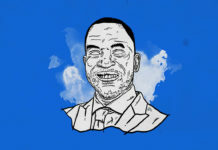 In this way they are able to either win the second ball or immediately press from the blind side, which poses problems for many opponents. After a long ball, Mainz counter-press Frankfurt’s midfielder from the blind side. Within the final third, Mainz attackers like to play through-balls to break the last line of defence. This concept is a consequence of their superiority in central areas. 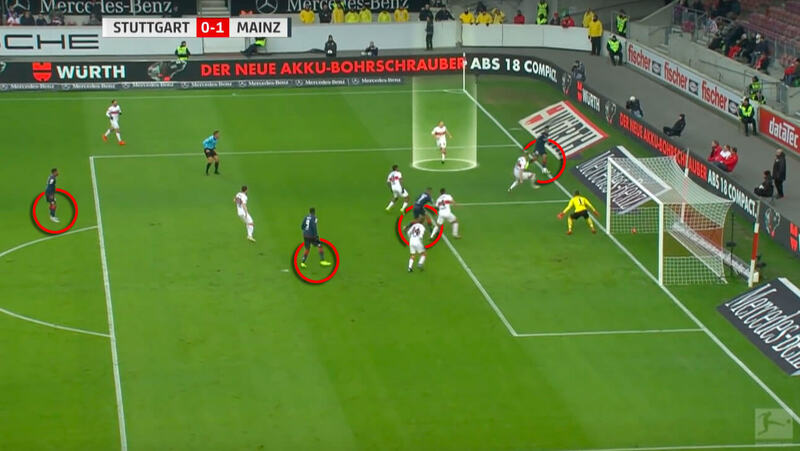 With two strikers and four central midfielders, Schwarz’s side often get the opportunity to penetrate the back line by playing through the opposition block. Playmaker Jean-Paul Boëtius gets behind the last line of defence with a diagonal run. 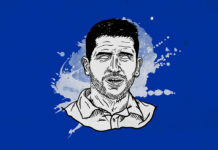 With the pace of their strikers, they provide a constant threat for any opponent. The strike duo attempt to position themselves between the opposition defenders to complicate defending. Anthony Ujah plays a through-ball to Quaison as Mainz overplay Berlin’s last line of defence. When Mainz attacking down the flanks, their strikers occupy the penalty area. Often at least one additional midfielder joins the box while another one awaits a possible rebound outside. Two attackers position themselves at the first post and in the centre. Another Mainz player stays outside of the box to receive a back pass or rebound. To support the full-backs in wide areas, a nearby midfielder drifts towards the wing. With this setup, Mainz attempt to put in crosses. Whenever the opposition is too focused on covering the strikers, Mainz utilise the gap between the full-backs and centre-backs to cut inside and shoot from promising positions. Instead of putting in a cross, Gbamin dribbles towards the goal. The midfielder exploits the free space and scores from outside the penalty area. Schwarz likes his side to press high up the pitch and force the opposition into one-on-one situations. By pressing in a man-oriented way, Mainz midfielders force their direct opponents to play imprecise passes or even win tackles. Mainz force the opposition midfielders into duels. In this situation, Mainz can even intercept the pass into the centre due to tight marking. On the one hand, this can lead to some promising counter-attacking opportunities up front as in the situation below. With their pacy attackers, Schwarz’s team outnumber the opposition defence in a fast counter-attack. On the other hand though, Mainz sometimes lack organisation within their own half, once their initial press is overplayed. As many Mainz players still focus on their direct opponents around the own penalty area, they offer gaps for the opposition from time to time. The defenders offer Stuttgart’s attacker plenty of space within the penalty area. Bundesliga teams with strong attacking departments such as Bayern Munich and Leverkusen have penalised this behaviour lately, beating Mainz 6-0 and 5-1 respectively. This leaves some room for improvement. Schwarz will have to find a way to lend his defence more compactness. 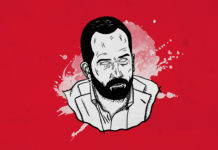 All in all, Sandro Schwarz has stabilised a young team at Mainz and therefore is one to keep an eye on. The German head coach banks on simple concepts to progress up the pitch. Clever usage of their full-backs enables Mainz to attack down the flanks. And last but not least by counter-pressing loose balls in midfield, Mainz are able to dominate the game. Nevertheless, bad defensive behaviour near their goal as well as individual mistakes make Mainz struggle in several matches. But since the squad contains many promising youngsters, Mainz will still have time to develop under the reigns of Sandro Schwarz.